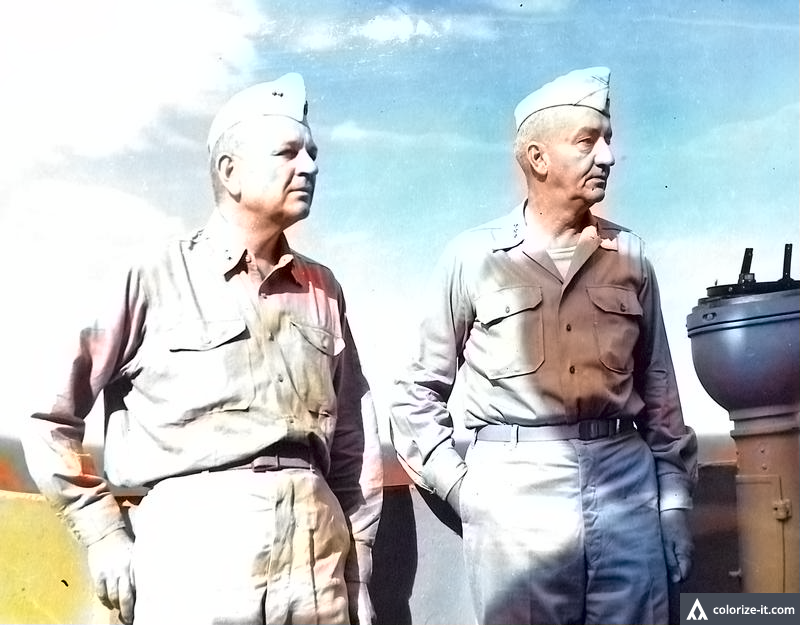 Gen. Robert Eichelberger and Rear Admiral W. M. Fechteler on the USS Spencer en route to Nasugbu. Image source: United States National Archives. 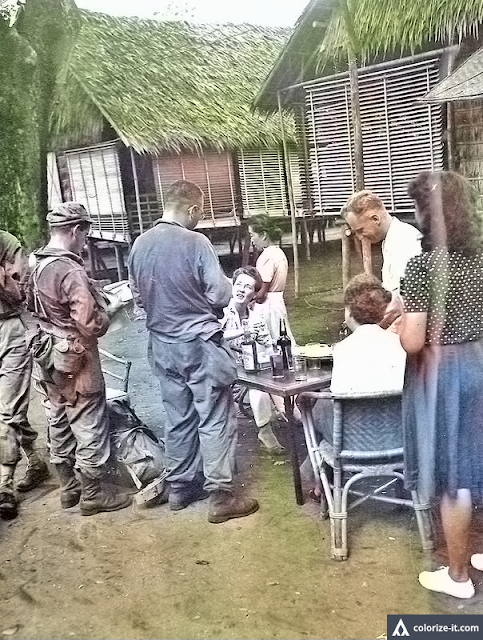 Colorized courtesy of Algorithmia. A previous article in Batangas History already touched on the subject of the Nasugbu Landing, i.e. the landing of United States troops on the beaches of Nasugbu on 31 January 1945; but it focused more on the significance of the landing to the subsequent liberation of Batangas from Japanese occupation. This previous article barely touched on the landing itself; and this we now try to remedy with information as provided by an American soldier by the name of Major Edward M. Flanagan Jr., who presumably was part of this historic event1. The 11th Airborne was first activated on 25 February 1943 but was initially held in reserve in the United States in the first half of 1944. By June, the division was sent to the Pacific Theatre of Operations and first saw action during the invasion of Leyte in October. With Leyte firmly in their hands, by January the Americans had the invasion of Luzon in their sights. On 9 January, assisted by the United States Navy and the Royal Australian Navy, the forces of the United States 6th Army had landed on the beachheads of Lingayen and San Fabian4. From there it would tear down south to liberate the capital city of Manila. 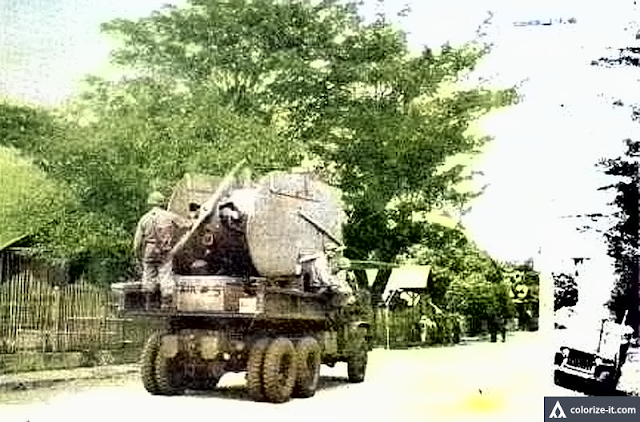 A light plane being carried on a truck through a street in Nasugbu, 1945. Image source: Eyes Of The War: A Photographic Report Of World War II, Vol. II. Colorized courtesy of Algorithmia. “11th A/B will land one regimental combat team (RCT) on X-day and H-hour in the Nasugbu area, seize and defend a beachhead; 511th Parachute Regimental Combat Team will be prepared to move by air from Leyte and Mindoro bases, land by parachute on Tagaytay Ridge, effect a junction with the force of the 11th A/B Div moving inland from Nasugbu; the 11th A/B Div, reinforced, after assembling on Tagaytay Ridge will be prepared for further action to the north and east as directed by the Commanding General, Eighth Army. Before setting out for Mindoro, where it would be based for a few days before hopping over to Nasugbu, the 11th participated in a dry run of the landing in Leyte on 26 January. After the successful practice, the troops boarded their ships and sailed from Leyte to Luzon. The convoy was led by the command ship Spencer and was made up of four “four APDs (high speed transport ships), destroyers from which personnel were landed in LCPs (a type of landing craft), thirty-two LCIs (a craft for landing infantry directly onto the beach) and six LSTs (a type of landing craft that could carry tanks, vehicles, troops and cargo onto the beach).” The convoy was to take the troops to Mindoro where it would await orders. By 8:15, the shelling of the beach stopped. The first wave of landing crafts headed for shore. Once close, the landing crafts opened and the soldiers stepped onto the surf and waded in ankle-deep waters to get to the shore. There was surprisingly little resistance except for “light sporadic machine gun fire and a few scattered rounds of artillery from caves on Nasugbu Point on the north flank and San Diego Point on the South flank.” Patrols were immediately sent to put an end to these threats. Nasugbu had a village square and a bandstand. Image source: United States National Archives. Colorized courtesy of Algorithmia. The light resistance was because Japanese defenders had retreated to the hills to ensconce themselves in previously prepared defensive positions. By 9:45, the town of Nasugbu along with its airstrip was entirely in American hands. “Nasugbu was relatively untouched by the war and was the first town of any consequence that we had seen since we left the States. 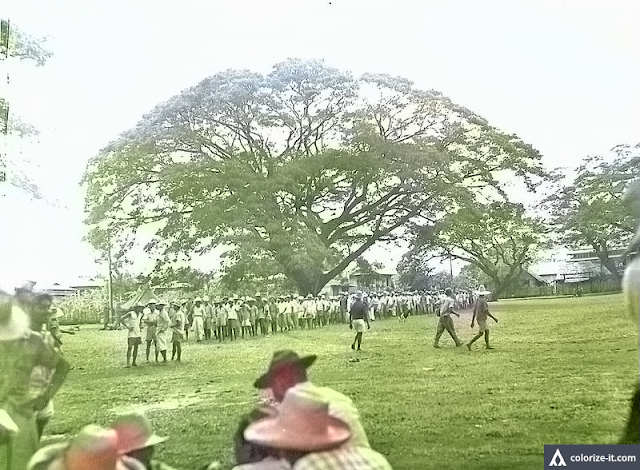 It was complete with (a) village square and bandstand, the site of the first Division CP (command post) in Luzon. As much as the Americans would have loved to linger and savor the welcome of the locals, unfortunately they could not. The Japanese were retreating and they had to be pursued before they could regain their balance. Spanish evacuees from Manila welcome American soldiers. Image source: United States National Archives. Colorized courtesy of Algorithmia. 4 “Invasion of Lingayen Gulf,” Wikipedia. 5 “Robert L. Eichelberger” was the Commander of the United States Eighth Army. Wikipedia.